Or why Pro.Tools packages are called professional statistics collection? To find out the answer, look at the list of Pro.Tools products, which are collections of stats and popups for Hold’em, Omaha (including CAP tables), cash and tournaments, as well as for HUDs for 6-9max, 3max(Spin) and Heads-Up. The list contains all types of games and table sizes. We made products which are adapted for different features with due account for the rules and dynamics used in each type of the game. Different games, rules, table sizes, due to research and huge work with statistics, we created collection of stats that allow to better understand opponents and their game strategies. Research of game fields was needed to better understand which specific statistics can be used. After analysis and generalization of obtained data, you can now use the actual and detailed statistics on preflop and postflop that is used in Hold’em or Omaha, cash or tournaments. Great attention is paid to optimum location of stats in popups. The structure of stats placement in popups that we have invented (outlined stats blocks) allows to see better next actions, despite the huge amount of general stats in Pro.Tools all functionality of the packs is easy-to-use. Pro.Tools packages provide the functionality with wide capabilities in gameplay and exploiting of opponents. They will be added to standard statistics and will allow deeper understanding of the opponents you are playing with. We are the biggest stats/definitions developers for Notecaddy, Pro.Tools and Text.Notes packages are the most comprehensive available stats collection featuring the widest scope of capabilities (the structure and content of ALL the packages are expanded continuously; for example during the recent year: for Pro.Tools (cash) were 5 addons, while content and functionality of the pack have doubled). 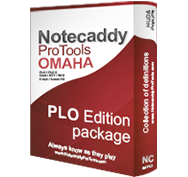 We work and will go on working actively to improve and extend Pro.Tools’ capabilities to make playing poker more handy and interesting.